Marsh, James H.. "Canada's Forgotten Baseball History". The Canadian Encyclopedia, 25 January 2019, Historica Canada. 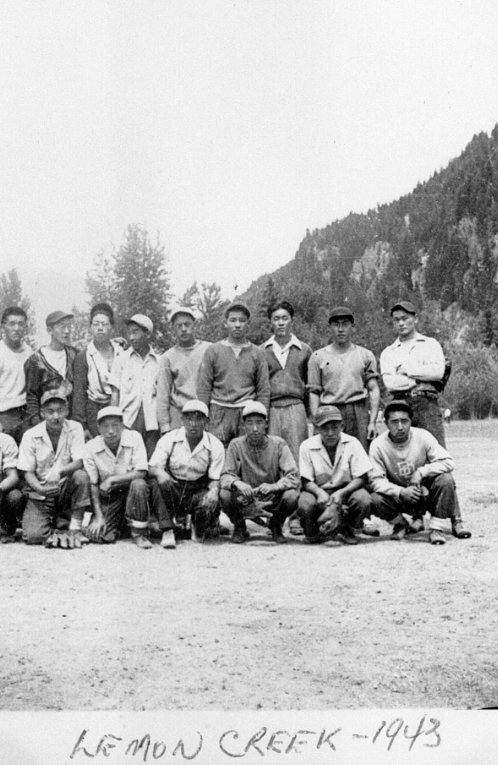 https://www.thecanadianencyclopedia.ca/en/article/canadians-in-baseball-the-lost-tribe-feature. Accessed 20 April 2019. The sport spread quickly across Canada. They played "bat" in Red River in the 1830s. In a game in Huntington, Québec in the 1830s, one Hazelton Moore threw a bean ball and ignited a brawl. Halifax and Saint John had teams as early as 1838. The Blue Jays are celebrating their 35th season in the majors and the Expos are lamenting their last, but baseball has much deeper roots in Canada. Baseball was once so popular in Canada that there was even talk of making it our national sport. The story goes back far enough. The first game was played in Beachville, Ontario, about 40 kilometres east of London, on June 4, 1838, with a ball of twisted yarn and a club carved from cedar. In the audience was a battalion of Scots volunteers on their way to mop up the remnants of the Upper Canada Rebellion. This baseball game predated by 7 years the establishment by Alexander Cartwright of the first American team, the New York Knickerbockers. The sport spread quickly across Canada. They played "bat" in Red River in the 1830s. In a game in Huntington, Québec in the 1830s, one Hazelton Moore threw a bean ball and ignited a brawl. Halifax and Saint John had teams as early as 1838. But the game flourished most of all in southwestern Ontario. The Guelph Maple Leafs were the first to import American professionals, including Bud Fowler, the first Black to play professional baseball. Proving that winning baseball has always been "about the pitching," Canadian star pitcher William Smith led Guelph to the world semiprofessional baseball championship in 1874 in Watertown, NY. The following year, one of baseball's first curveball pitchers, Fred Goldsmith, helped the London Tecumsehs dethrone Guelph as Canadian champions. 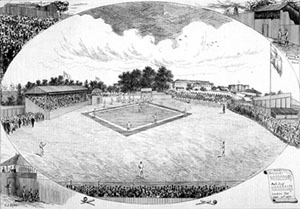 Tecumseh Baseball Park, 1877, home of the London Tecumsehs. From the Canadian Illustrated News. In 1877, in competition with the National League, which tried to monopolize the best baseball talent, a number of smaller American centres organized the International Association. London and Guelph joined and the Tecumsehs won the first championship with a season-ending 5-2 victory over the Pittsburgh Alleghenys, not exactly a "world series," but still 115 years before the Toronto Blue Jays won theirs. The game continued to thrive locally. By 1904 baseball was so popular in the Yukon that a 2-game international championship was played and won by Whitehorse over the Alaskan town of Skagway. Coal-mining towns in Cape Breton supported a minor league in the late 1930s. The Provincial League in Québec survived beyond the control of major league baseball from 1935 to the early 1960s. It was in this league that the first crack in baseball apartheid occurred, laying the groundwork for the famous debut of Jackie Robinson with the Montreal Royals in 1946. Along with Canada's forgotten baseball history, there are several forgotten individuals. The first Canadian-born major league player, William Phillips of Saint John, NB, played for Cleveland in 1879. Most of us know Ferguson Jenkins, of Chatham, Ont., who was the first Canadian to be voted into baseball's Hall of Fame in Cooperstown, New York, and Larry Walker of Maple Ridge, BC, was named the National League's most valuable player in 1997. But the exploits of several other Canadians are largely unknown, including those of "Tip" O'Neill of Springfield, Ont., who set an all-time batting record of .492 in 1877; Bob Emslie of Guelph, Ont., whose pitching career was highlighted by his 32-17 season for Baltimore in 1884; George "Mooney" Gibson of London, Ont., who was a member of the Pirates' 1909 World Series winning team; Phil Marchildon of Penetanguishene, Ont., who was the ace of the Philadelphia Phillies pitching staff during the 1940s; Claude Raymond of St-Jean-sur-Richelieu, Que., who pitched 12 years in the majors (1959-1971); and Ron Taylor of Toronto who pitched 11 shutout innings for Cleveland in his major-league debut in 1962. As baseball historian William Humber writes, "the story of baseball in Canada is that of the lost tribe... of American baseball history." The story of baseball in Canada is not only a reminder of a golden age in sport, before it was "all about the money," but of the roads not taken in our North American journey.